The Drunken Duck has an ace up its’ sleeve. Out the back, they’ve got their own micro-brewery. 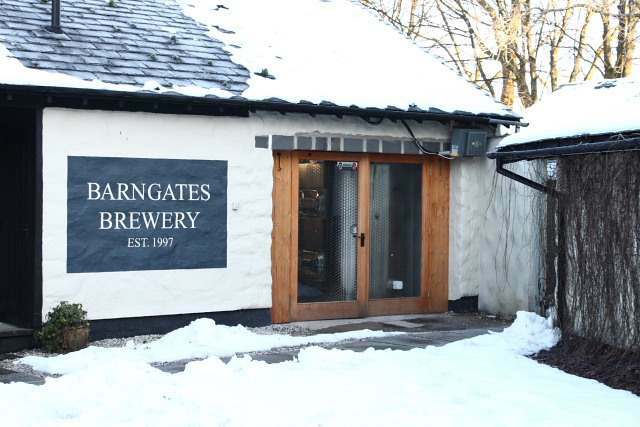 Barngates Brewery was founded in 1997, as an experiment to supply the Duck’s bar with some of it’s own beer. In 1999, the operation was expanded to a five-barrel plant, and in 2008, with the help of some shiny new equipment, into a ten-barrel micro-brewery. Production is now up to about thirty barrels a week, using the Inn’s own water supply, which is very soft and has a slight brownish tinge from the peat hills (“reminiscent of a malt whisky”, they say, romatically stretching the point). We were warned that the water wasn’t to everybody’s liking, hence the presence of bottled water everywhere, but, I quite liked the earthiness of it, and this background note follows through into the beer. Barngates produce seven regular beers, each named after one of the Inn’s former pets. Mothbag is a light, golden ale, with the stab and tang of citrus. It’s lively and bitter. Tag Lag is similarly light, copper in colour, dusky and bitter. Red Bull Terrier is a beast of a beer, a dark red brew with a hoppy smell and a malty taste. It’s spicy and sweet, with a distinctive caramel undertone. Barngate’s other beers include Cracker, Pride of Westmorland, Westmorland Gold and Chesters. I’ve got a bottle of Chesters to try, but (foolishly?) vowed not to drink anything in January (there, it’s public now. I’ve got to do it). It’ll have to wait until February, good as it looks. Fantastic! What a keen find to share, this microbrewery; it's like discovering a hidden treasure. There was a beer we had at that winter beer festival that had their beer brewing away in a bourbon barrel. Amazing flavor. There's another beer festival coming up at the end of the month, a Belgian beer festival. Can't wait to take photos and write up a post! @wasabiprime – I've tasted beers that have been aged in old whisky casks before. The flavour is amazing.